Well I made it to Day 4 living on less than £1 a day, but I’m really tired and have been desperate all day for a sugar boost – but not allowed as it would risk my levels of nutritious food consumption! 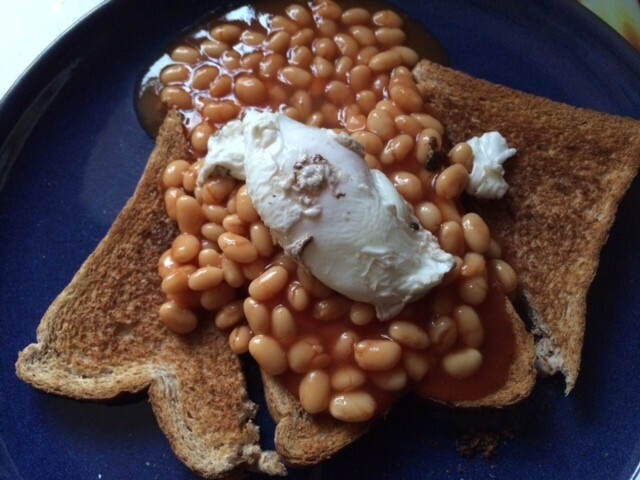 I was going to start the day with porridge (that would have been cheap and sensible) but I gave in to a flight of fancy and went with beans on toast with a poached egg. I skipped the butter so a Brekkie grand total of 26p! Lunch followed the same pattern as yesterday with Egg Bhujia and 2 chapatti, although today I use just 1/4 of a tomato, since I had had such an extravagant breakfast, and just one egg. Head the oil, add the chopped chilli and onion, fry for two minutes then add the tomato and salt, then cook until soft. Add the beaten egg and cook (as you would scrambled eggs) until egg is firm. Lunch total 20p. A saving on yesterday but an unsubstantial lunch!! I felt very hungry all afternoon and was longing to get home for dinner and also longing for some vegetables. I went to the Coop on the way home to buy some rice and just happened to find some vegetables reduced – 7 carrots, 2 onions, a parsnip and a swede for just 37p. That approximately 3p per carrot, 2p per onion, 4p for a parsnip and 8p for the swede! So my plan for egg fried rice became Vegetable and Egg Fried Rice, costing just 36p!. Boil the rice and leave to cool. Heat the oil; fry the chilli, onion, beans and carrot until soft (cover with a lid if necessary), add salt to taste. Add the egg and scramble with the vegetables. Finally, add the soy seasoning sauce and stir until all the rice is coated. Wow delicious and just 82p so far today! But I had a strong desire for something sweet…. what could I have for 18p??? I rummaged through the cupboards. There was a can of coke, but that worked out at 27p from the multipack – too much! Then I spotted it, well hidden at the back of the cupboard, the last of the four kitkat chunky’s that I bought last week (4 for £1). I settled on half a kitkat – 13p! Stopping at half was a challenge… so I decided to step away from the kitchen and food supplies and take an early night. Day 4 total – 95p! So if you are feeling sympathy with the cause, what can you do to help? If you want to know more about my experiences and the recipes I am using then follow this blog.